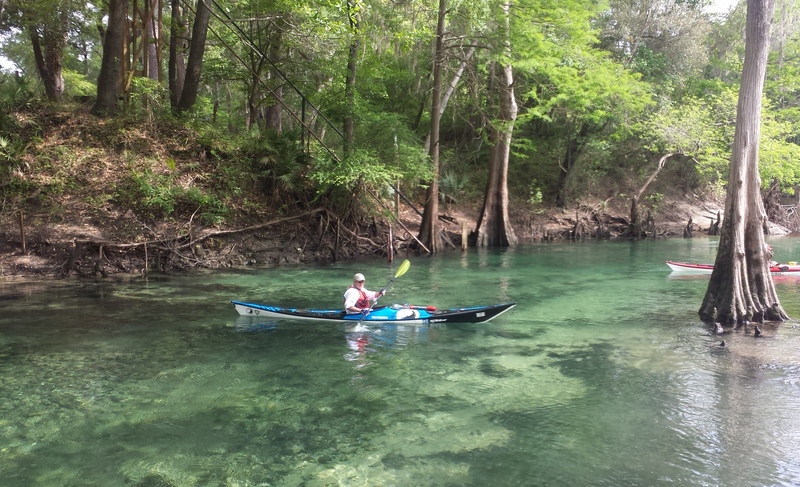 Past Trip Reviews | Gainesville Florida | Paddle Florida, Inc.
Twenty-five paddlers kicked off Paddle Florida's 2013-14 season with a 75-mile, five-day adventure down the Suwannee River Wilderness Trail. The trail offers paddlers several scenic state parks and river camps...and plenty of springs! With daily temperatures in the mid-80's, many paddlers cooled off with daily leaps into these refreshing blue pools. Nighttime entertainment featured the toe-tappin' tunes of Big Cypress Bluegrass, a documentary film on the Florida Wildlife Corridor, and informative lectures from Suwannee River Water Management District representative Charlie Houder, Save our Suwannee advocate Annette Long and 'Sturgeon General' Ken Sulak from the USGS. This trip also marked a Paddle Florida first: Scott Baste was the first paddler to complete one of our trips completely on a stand-up paddleboard (SUP). He seemed no worse for wear at trip's end, so we hope other SUP'ers will follow suit on our future trips. A big THANK-YOU goes out to all who participated and made this such an enjoyable week, not the least of whom was our magnificent caterer: Shelby's Restaurant in Madison. No one lost a pound on this trip!Check out the YouTube video, below, by Kevin Mims of the latest Suwannee River adventure, from the Spirit of the Suwannee Music Park to Branford. Before we left for the Ochlockonee, many of us had consulted the 10-day weather forecast and were pleased to see that there was very little chance of rain and that seasonal temperatures were expected. As life happens, the forecast changed as we started the trip and there were several rain events that gave us practice in setting up and dismantling our camps in wet conditions. It was one of the few times that I have ever worn my rain gear on these trips. Of the ten Paddle Florida trips I have gone on, this is only the second time that rain has been an issue for more than a few hours. Most trips have been blessed with good weather... Read the entire trip report by Mim Duncan. Paddlers spent Valentine's Day and Presidents Day weekend paddling from Lake Panasofkee to Bird Creek Park on the Gulf of Mexico, with a side trip/overnight to Rainbow Springs State Park. Read the Trip Report by Doug Alderson. On a crystalline fall day, temperatures rising into the 70s, a Paddle Florida group of fifty began their adventure down a spring-fed, sandy bottom stream. Read Doug Alderson's vivid trip report about the 30-mile ramble. Thirty-five paddlers finished a 65-mile journey down the Suwannee River Wilderness Trail on Paddle Florida's first trip of the 2012-13 season. The trip showcased three state parks, two river camps, and one spectacular full moon. Several paddlers jumped at the opportunity to experience an invigorating swim in the many clear blue springs which line the river. Suwannee River Water Management District Executive Director Ann Shortelle and springs advocate Annette Long gave informative presentations about the state of the region's watershed. Musicians Tom Shed and Grant Peeples braved chilly temperatures to delight paddlers around the campfire with their unique song stylings. A big thank-you goes to all the paddlers, speakers, musicians, caterers, and park hosts who made the week so enjoyable. We look forward to seeing you on future trips! Go to the link to Don Yackel's comprehensive trip report, including extra photos and video. Dam to the Bay logo Six days on north Florida's Ochlockonee River, part of Florida's statewide trail system managed by the Florida Dept. of Environmental Protection Office of Greenways and Trails. Trip report by Doug Alderson. A three-day, 42-mile paddle along the Peace River Canoe Trail, part of Florida's statewide trail system managed by the Florida Dept. of Environmental Protection Office of Greenways and Trails. Official Outfitter: O-Sea-D Aquatic Adventures. An open water paddle from John Pennekamp State Park to Zachary Taylor State Park. A 10-day, 115-mile journey, following the route of the Henry Flagler's overseas railway and arriving in Key West on the 100th anniversary of the opening of the rail line. Follow this link to a slide show/video of the first day on the water, created by Patti Gross. Trip report by Doug Alderson. Suwannee River map4th Annual Fall Paddle Florida on the Suwannee. 123 miles of the Suwannee River Wilderness Trail from the Spirit of the Suwannee Music Park to Manatee Springs State Park. Details of the 2011 trip Here. Trip report by Doug Alderson. Dam to the Bay on the Ochlockonee RiverWinding through north Florida wilderness, the Ochlockonee offered Paddle Florida adventurers 76 miles of natural beauty. Official Outfitter: The Wilderness Way. Read the trip report by veteran paddler Doug Alderson. Keys paddle logoThe Keys ChallengeOfficial Outfitter: Florida Bay OutfittersA short stretch of the Florida Keys Overseas Heritage Trail – from Curry Hammock State Park to Bahia Honda State Park provided a 30-mile Atlantic Ocean adventure for paddlers over the Presidents Day weekend. Check here for a trip report and see what paddlers have to say on our Facebook page. Paddlers braved record cold temperatures and brought back great memories of an unforgettable adventure down the Wekiva and St Johns rivers. Go here for the December 2010 Trip Report and a map of the route. Another great river adventure came to a close in the final days of March. Here's a short summary of events during Spring Paddle Florida on the Withlacoochee and Suwannee rivers. Go here for March 2010 trip report and river maps.